Frank Foster receiving Living Legacy Award at the Kennedy Center. Photo by Valerie Russell. Frank Foster, the saxophonist and composer best known for his 1953-64 tenure with the Count Basie Orchestra, died yesterday, July 26, in Chesapeake, Va. The cause of death was kidney failure. 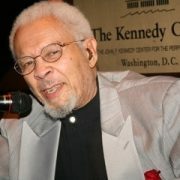 Foster, who was honored with an NEA Jazz Master award in 2002, was 82. Born in Cincinnati on Sept. 21, 1928, Foster first played piano and clarinet before switching to alto saxophone and finally tenor and soprano saxes, as well as flute. In 1949, after attending Wilberforce University, where he played in the dance band, Foster moved to Detroit, where he began his professional career with local bands. He served in the Army during the Korean War and joined Basie after his discharge in 1953. With Basie, Foster contributed song material as well as his instrumental parts. His composition “Shiny Stockings” became a hit for the band and was subsequently recorded by other artists, sometimes with lyrics: The All Music Guide Web site lists 432 recordings of the song, by such artists as Ella Fitzgerald, Oscar Peterson, Dexter Gordon and Milt Jackson. Other Foster songs performed by the Basie group included “Down for the Count,” “Blues Backstage,” “Blues in Hoss Flat” and “Back to the Apple.” His compositions were recorded by Sarah Vaughan, Frank Sinatra and numerous other performers. Foster also wrote arrangements for the Basie orchestra, including the entire 1960 Easin’ It album. After leaving Basie, Foster continued to write while playing with Elvin Jones (1970-1972) and the Thad Jones/Mel Lewis Orchestra. Foster co-led a quintet with fellow Basie saxophonist Frank Wess in 1983, and toured Europe as a member of Jimmy Smith’s quintet in 1985. He also led several of his own groups, including the 18-piece Loud Minority big band during the 1980s. In 1986, two years after Basie’s death, Foster led the Count Basie “ghost band,” with which he stayed until 1995. Beginning in 1953, Foster recorded numerous sessions and recorded as a leader for such labels as Blue Note, Prestige, Pablo, Savoy, Concord Jazz and others. Foster composed a commissioned work, “Lake Placid Suite,” for the 1980 Winter Olympics, written for jazz orchestra. In addition to his recording work and live performances, Foster served as an educator. Beginning in 1971 he taught in the New York City public school system in Harlem, and was an assistant professor in the Black Studies Program at the State College of New York at Buffalo from 1972-76. He also taught at Queens College. In 1987, he was awarded an honorary doctorate by Ohio’s Central State University. Foster was also an Artist in Residence at the New England Conservatory of Music in Boston in 1971. Foster suffered a stroke in 2001. He continued to write and arrange music but ultimately curtailed his saxophone playing. He became active with the Jazz Foundation of America, an organization that helps musicians in need of emergency funds.